The property sees its fair share of wildlife like mountain lions, cougars, and wolves. The 3,246-square-foot home was renovated in 2009 and includes new tile flooring, appliances, and bathroom upgrades. It includes four bedrooms, five bathrooms, and a 1,200-square-foot deck, as well as three large fireplaces. 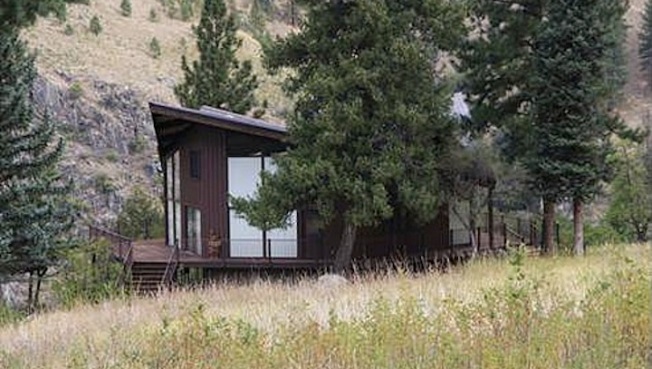 Located along the Main Salmon River, which allows for fishing and white-water rafting, the home sees its fair share of wildlife like mountain lions, cougars, and wolves. "Once you're there," the owner claims, "the rest of the world goes away." See more, plus gorgeous photos of the home, on the Wall Street Journal.